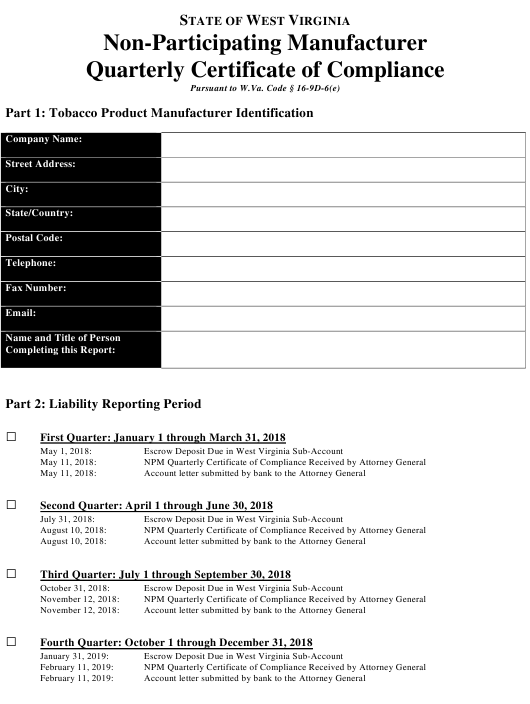 This fillable "Non-participating Manufacturer Quarterly Certificate of Compliance Form" is a document issued by the West Virginia Tax Department specifically for West Virginia residents. 1. Proof of the amount and date of deposit to West Virginia’s segregated sub-account for the 2017 quarterly sales. 2. A current ledger of the tobacco product manufacturer’s segregated sub-account for West Virginia. plus the inflation adjustment for 2018 ($0.0159057). 3. Multiply Line A and B to determine the total escrow due for the quarter. SEGREGATED WEST VIRGINIA SUB-ACCOUNT BY THE DUE DATE INDICATED IN PART 2. D. If the NPM responded no to Questions A, B, or C, please provide an explanation in attachment. An authorized officer of the NPM MUST sign this form and have it notarized. to determine the veracity of assertions and representations made in this certification. Subscribed and sworn to before me this ________ day of _____________________, 20_____.